Under federal law, you have the right to view your medical history in the form of medical records. The 2003 Health Insurance Portability and Accountability Act, known as HIPAA, "requires health care providers, health plans, and health care clearinghouses to allow you access to your medical records," according to Privacy Rights Clearinghouse. HIPAA applies only to organizations that keep electronic medical records. In addition, some states have medical records privacy laws on the books. If your state does have such laws and you are denied access to your history, you may have more than one avenue of recourse. 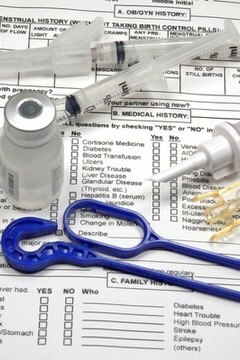 Request your medical records in writing. Putting your request in writing allows you to provide specifics and allows you and your practitioner to keep a record of the request. Include the dates you were treated. If you do not want to see all of your medical records, ask for specific test results or doctor's notes, for example. Send your request by mail; most offices will also accept the request by fax. Pay the administrative fees. Most physicians and hospitals will require you pay a fee to cover the cost of photocopying your records and an additional fee if you want the records mailed to you. If the fees sound high to you, check your state medical privacy law to see if there is a provision that places limits on the fees for copying and mailing medical records. If there is, and you feel your doctor's fees are not reasonable, follow up with the appropriate state agency. Give the facility at least 30 days to respond. If you have not heard from your practitioner within 30 days, contact the office. Under HIPAA, your doctor has 30 days to get back to you; the law provides for another 30 days only if a good reason is provided. If you find after 30 days that the records have been copied but not mailed, it may be easier to simply pick them up. Picking them up will also allow you to avoid a mailing fee. Laverne, D.. "How to View My Medical History." , https://legalbeagle.com/6187915-medical-history.html. Accessed 20 April 2019.